Moroccan authorities have taken action against the floating abortion mill commandeered by the Dutch abortion group Women on Waves. In a press release today, the abortion activist group notes that their ship was due to arrive in the harbor of Smir at 1pm local time but was blocked by warships. The abortion ship offers to use the abortion drug regimen called RU-486, a combination of Mifepristone and Misoprostol, for women with early term pregnancies. 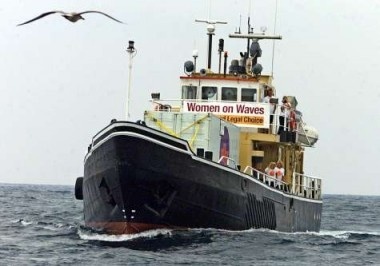 Women on Waves claims that according to international law, if the boat is outside a 12-mile radius from shore, Dutch law applies to the boat, allowing “medical” or chemical abortions on board. In 2004, the Portuguese government refused the ship permission to enter Portugal’s territorial waters, a decision that was later upheld by the country’s courts. Then-secretary of state for sea affairs, Nuno Fernandes Thomaz, told the daily newspaper Diraio de Noticias, “If the ship decides to disrespect the orders of the Portuguese government it will have to get round a navy vessel”. In 2007, when Women on Waves founder Rebecca Gomperts went to Malta to deliver a lecture in favour of legalized abortion, she was met by more protesters who held a candlelight vigil outside the lecture venue and the press conference had to be closed to the public. It’s a nervy move to set about offending the Muslims. Just ask any convert to Christianity from Islam – you can get yourself killed for being politically incorrect in the Muslim world. One wonders if Rebecca Gomperts would be so forthcoming if she was risking her life to say what she has to say.